The recent international design competition for a marine research center in Bali Indonesia gave firm solus4 an opportunity to study and architecturally interpret the structure of tsunami waves. The competition, sought to address the need for tsunami research and preparation in response to the devastation caused by the 2004 Indian Ocean earthquake and tsunami. 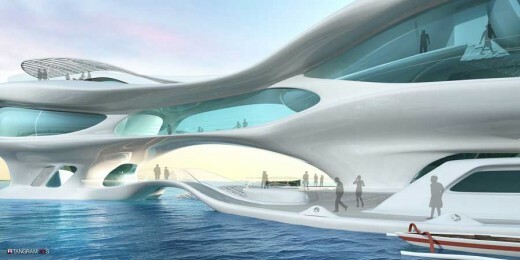 The 2500 square meter Marine Research Center would be located 150 meters off shore from the of Kuta beach. It is an imposing fluid structure that seamlessly adapts to its natural aquatic environment and allows visitors and scientist to have a direct visual connection to the exterior. 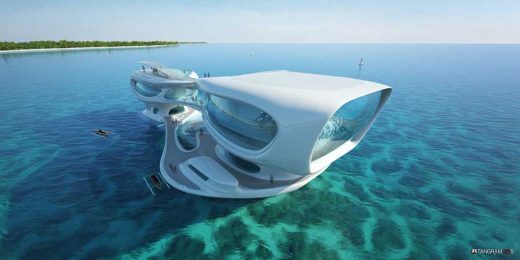 The program which consists of research labs, bedrooms for scientist, seawater pool, aquatic garden library and an auditorium would be distributed under and over the surface of the sea. The solus4 design team sought to understand the wave dynamics and the resulting wave force patterns that are generated as tsunami waves are created and radiate out from an epicenter. The wave forces, when translated to linear patterns, inform the shapes that are integrated into the building form and result in patterns that seem to be born of the sea. Building forms are then used to respond to the programmatic requirements of the facility for both on-board scientists and the interested visitor. 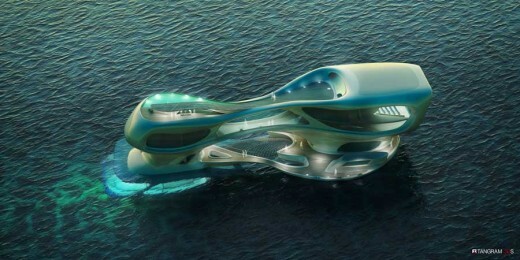 In keeping with the nature of the universal ocean, the project is intended to be wholly energy efficient. Large glass-based panels form the skin – both transparent and opaque as well as embedded PV cells. The close in to shore location allows for tidal/current generators to serve the power requirements. Rainwater collection and seawater conversion systems take care of the domestic water requirements. Deeper source seawater is circulated through the skin for radiant cooling and temperature control of the overall anthropomorphic shape. The unique shapes and programmatic requirements would serve as an icon for scientific study and tourism in this location. Solus4 is an architectural studio specializing in architecture, planning and interior design, headquartered in Kittery, Maine. The firm, while newly formed, has an extensive background in commercial, residential, institutional and hospitality design and planning through the experience of its partners. Solus4 operates as a collaborative on a global platform, adding intensively focused experience to each commission through key team members who specialize in sustainability strategies, macro planning, community building, project logistics and team management. The four partners have brought together over 100 years experience in successful projects throughout North and South America as well as Europe and the Middle East. President Duncan Pendlebury AIA NCARB CCS started working internationally on hotels and residences in the Caribbean in the early part of the 1970’s and went on to carry out projects in the Middle East starting in 1974. Marian Vaida AIA LEED AP heads up the firm’s project management. Her thirty plus years of experience ranging from Greenland to Dubai to Lake Tahoe has included a variety of scales and scopes in commercial, residential and hospitality projects. Alfonso Lopez LEED AP leads the design efforts with his background in both domestic and international venues. His portfolio ranges from single family residences to high rise hotels and office buildings. The firm works on a collaborative model bringing its core experience to add value to the Client’s solution and incorporates highly specialized key collaborators from an international cross section of trusted associates. In this way, the firm can deliver at the scale and scope required by each Client. Solus4 is committed to bring added value to each Client’s endeavor through passion, experience and sensitivity. Current projects include large scale retail development, several single family homes, high rise residential and studies of housing programs for underserved populations. For more information, visit the company web site at www.solus4.com.